The trouble with college math classes – which classes consist almost entirely in the rhythmic ingestion and regurgitation of abstract information, and are paced in such a way as to maximize this reciprocal data-flow – is that their shear surface-level difficulty can fool us into thinking we really know something when all we really “know” is abstract formulas and rules for their deployment. Rarely do math classes ever tell us if a formula is truely significant, or why, or where it came from, or what was at stake. And, of course, rarely do students think to ask – the formulas alone take so much work to “understand” (i.e., be able to solve problems correctly with), we often aren;t aware that we don’t understand them at all. That we end up not even knowing that we don’t know if the most incidious part of most math classes. I must have been lucky. 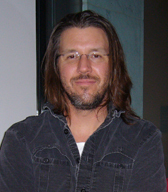 My Calculus & Linear Algebra 1 lecturer was David Eliot. He often told us that a formula or theorem was significant, and would digress into the lives and careers of their discoverers. He delighted in trying to pronounce their names the “right” way.